I’m having an issue in Cantabile when trying to use Roland Cloud VSTs. I’ve got 3 installed: JV1080, SRX Orchestral & SRX Keyboards. I can add one of them as a plugin in Cantabile and it plays just fine, but as soon as a I add a 2nd (either as an embedded plugin or a linked rack) I just get loads of distortion. If I disable the racks / plugins so that only one is enabled, I’m back to normal but as soon as there is more than one plugin enabled - they’re unplayable! A second instance if the same plugin (eg 2 lots of the JV1080) has the same issue. Assuming you are using an Asio driver? What is the buffer size? Try the next step, e. g. if you are using 128, try 256. Yeah, tried the ASIO driver for the module and ASIO4All at 512 & 1024 and still the same effect. I can have all sorts of other plugins enabled (currently got M1, Wavestation Xpand2! and an instance of Kontakt) with no issues even at 256. As soon as a 2nd Roland plugin is enabled, there’s massive distortion. Not just pops and clicks, full on distortion and complete stops in the sound. Hi Ben. I agree with Derek. Send a song file and let us try it out on our rigs. My gear is packed up, but will be able to test it later today. Thanks for the offers to help. Attached is a sample song that demonstrates the issue (the one I’m working on has way more plugins but just the 2 is enough to reproduce on my rig). As soon as the 2nd plugin (SRX Orchestra) is enabled, the distortion starts. No real noticeable increase in CPU usage on the perf monitor. Thanks Ben. Will check it out soon. I had a late night gig last night, so kinda slow getting around to unpacking. C3’s Profiler? LatencyMon? Get any clues there? Have you checked that all plugins are authorized? When Roland plugins’ authorization times out (you need to refresh regularly - a nuisance…), they start creating loud distortion noises. Thanks for your help all - this truly is a wonderful community! Seems odd that in the past I’ve had quite a few Kontakt plugins running (pianos, Session Strings Pro plus several other instruments) and never found that I’m low in resources but just enabling another instance if a Roland one and it’s running at over 100% - with a single key press! 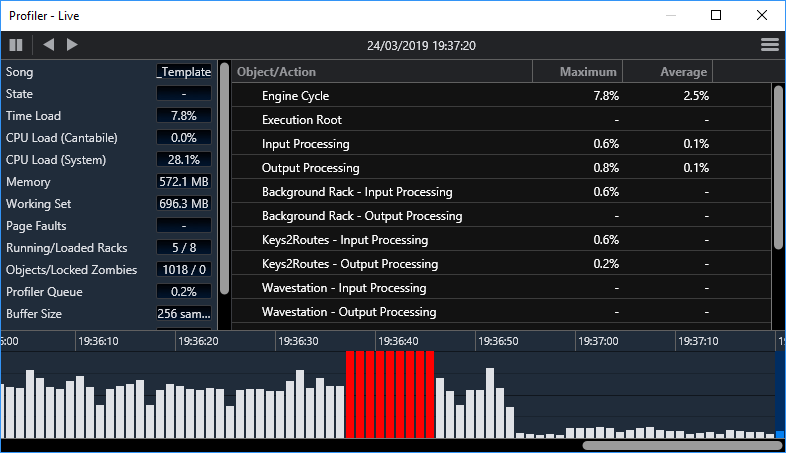 Is it normal for there to be a high value in the Engine Cycle metric if there is nothing playing, just a bunch of plugins enabled but no input? Here’s a small snapshot of the profiler for my main song file with Xpand, Wavestation & 3 Roland plugins. At the start of the picture, only one Roland plugin is enabled. Where it all goes red (19:36:38) is where I’ve enabled a 2nd one. Then I disabled the 2nd Roland one at 19:36:47 and goes back to the same the start of the trace. At 19:36:55, I disabled the one Roland plugin that was running and the metric dropped to ~ 5%. So is it normal to be such a high reading when there is no input? At no point in the picture below were any keys pressed on the keyboard. Hmmmm. What settings do you have for multi core processing? Check Windows (should be set to maximize background processes), Cantabile, and the plug-ins. I turn on multi core for C3 and turn it off for every plug-in. YMMV. See the “Glitch Free” eBook. Hi Ben. I finally got to this. For times sake, I am running this in Asio4All at 512 samples. When I first loaded it, it briefly spiked the load meter at 228, but every load since, it sits at 28% load. When I run the keys with my mouse, it goes no higher than 32%. The profiler showed the same thing. There was no distortion with either or both. Adding the second Roland only increased it by 5%. I will add Wavestation, Xpand and another Roland and get back. Edit: Added 2 Roland’s, Wavestation, and Xpand. My load shows 55%. When I added the 3rd Roland I avg 81%. The profiler shows the 3 Rolands avg about 28% each. Thanks @Corky. I’m guessing you have a bit more processing power than me so the % are lower. It does seem that the Roland plugins use a lot more than the others which is frustrating - I’m amazed at how much load there is when there is nothing playing - what are they doing?!? I’m coming to the conclusion that the Roland stuff is a bit buggy - I get crashes of the GUI when browsing for patches (mostly after going through 3 or 4 categories). I did a full uninstall of the 3 instruments and reinstalled them in case there was an issue - interestingly to start with after that I could have all 3 enabled and the load didn’t really go about 80% but once I played a few large chords on one patch it peaked and after that I was back to the high load as each was enabled. I’ve got ASIO4All set at 1024 samples for now - surprised I don’t notice the latency too much - but it seems about manageable. Maybe it’s time for some new hardware…although currently programming for a show that starts next week so might be a bit risky to do an upgrade before then! Why do I always leave it to the last minute?!? Thanks @RackedBrain. I have the processor management to prioritise background tasks so that one seems correct already. I can’t see a way of turning off multi core in the plugins themselves and am a bit confused by the options in C3. Changing from Compatible to Aggressive doesn’t seem to make much different in this instance. Frankly, I had so many issues with the Roland Cloud stuff for live performance that I ended my subscription. Most of the instruments were FAR too top-heavy for live performance if you had any other instruments loaded as well. I deemed them as being for DAW multi-track recording where you can freeze tracks (which I do not do much of) and not for performance duty and dropped the sub. You’d certainly need KILLER hardware to run some of those emulations BY THEMSELVES, for goodness sake! That’s the conclusion I’m fast coming to @terrybritton! Just googling “Roland Cloud CPU Usage” returns scores of people complaining about it. It’s jolly frustrating - I wanted to use the JV stuff as I have the real thing in the rack at home and find I can locate the sounds I want so much faster on that having used it for so long. Guess I’ll need to dust of the rack case for this show and bring the hardware with me. @Ben_Davidson. I too ended my Roland subscription. I was really looking forward to the JV1080, also. You might try the latest build @brad just put up. I don’t have a lot of hope it will help you, but worth a shot. BTW, I went with Uhe Zebra to replace the JV use and have never looked back. I emailed Roland Cloud folks asking if they could create a more affordable subscription, say 3 instruments for $5/month. I only want D50, JV1080, and one of the SRX instruments. But unfortunately I doubt that’ll happen. Also wish then as an alternative we could just buy them as individual VSTs.